The Towpath Volunteers have been bringing Our American Heritage to Life for over 30 years. While fifing and drumming has been around hundreds of year, most of us in the United States think of fifing and drumming as a Revolutionary War era military "band" thanks to movies such as Walt Disney's Johnny Tremain and Willard Archibald's painting "The Spirit of '76" (aka Yankee Doodle). The painting show a trio, a young boy and a elderly man playing a snare drums and a adult male playing a fife walking through a battle field. 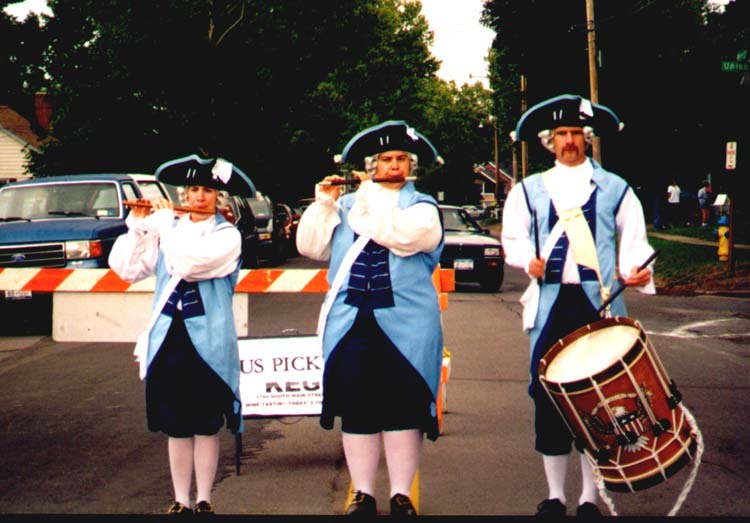 The Towpath Volunteers Spirit of 1776 is based on this painting with the exception of using 2 fifes and 1 snare drum. 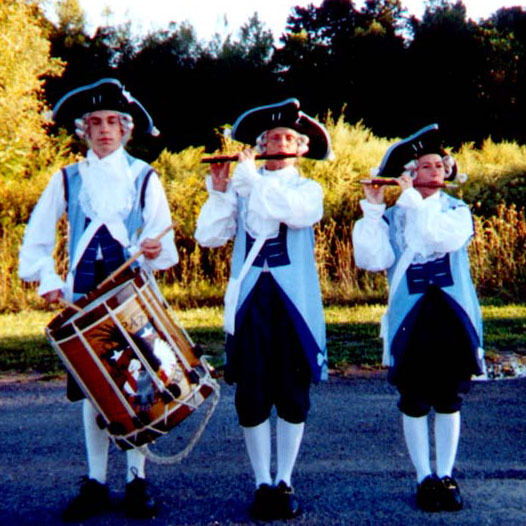 The is the second oldest part of the Towpath Volunteer Fife and Drum Corps. 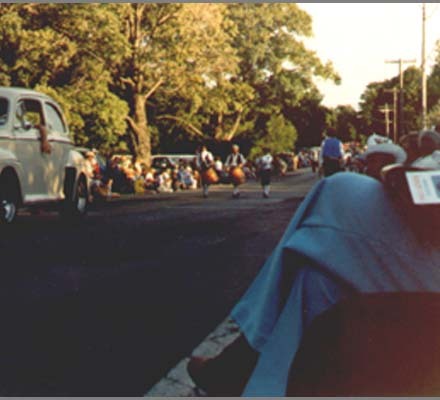 First used in 1978, as shown in the picture below, reproducing Willard Archibald's painting "The Spirit of '76" in a parade in Fair Haven, NY. Lessons learned, including the drums overpowering the fifer and lack of ability to perform harmonies, led to Towpath's change to two fifers and one drummer. The group has done many different performances over the years, including weddings. funerals, festivals, dedications, birthday celebrations, golf tournaments and more. The size, although not overpowering allows them to perform in limited size areas or on the move.